Welcome to Body and Weight Wednesday. Today I’ll be giving my one-month update on the Happy Body Program. The good the bad and the ugly. But first some background. 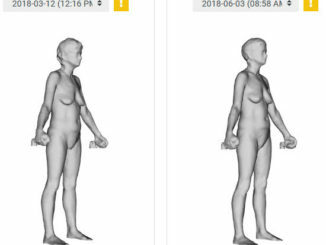 On December 1st I did a body composition scan. It revealed that while my weight had not changed over the last few decades, I had lost muscle and gained fat. You can listen to my thoughts about this and the realizations I had in episode 19 – Would you like to change your body. 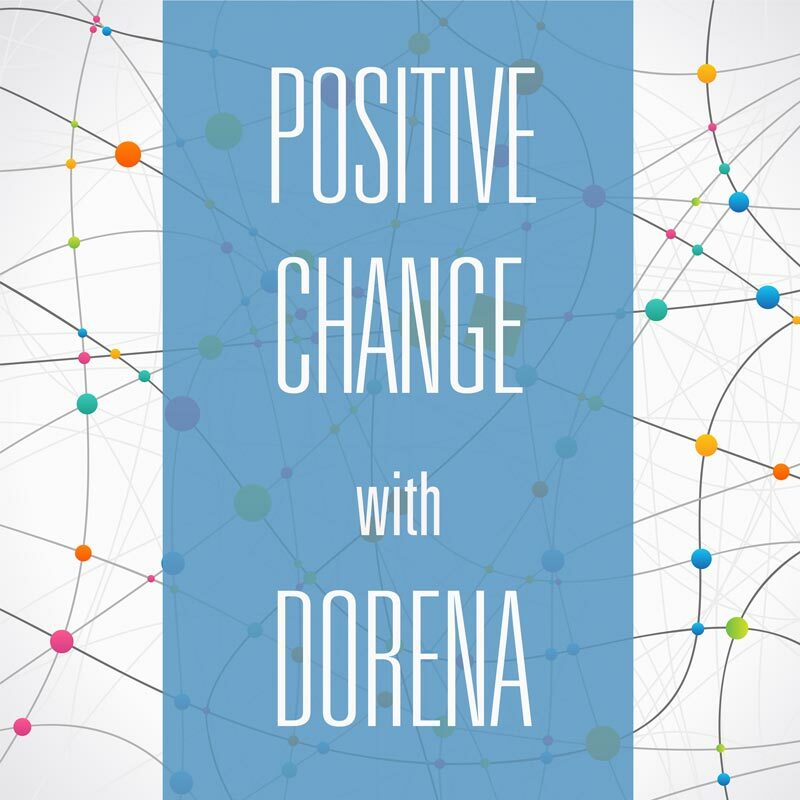 The scan and my desire to be healthy and strong led me to positive change. The first two weeks of December I tried being more active and eating a little less. The results? No noticeable change in my body and the scale was reading the same. I then looked at the hard choice of adopting a health program that would create true change in my body. The easier softer way didn’t seem to be giving me the results I desired. Episode 21 – Choosing a Happy Body details my painful process of making the choice. The Happy Body Program was created by Jerzy and Aniela Gregorek. In fact, after a couple weeks on the program, I was so excited it that I interviewed Jerzy. You can hear that interview as Episode 25 posted on Jan 3rd. The program is not a weight loss program or a program for increasing strength. Although it will do both of those. The program is designed as a youthfulness program. Some of the key components of youthfulness that the program targets are energy, agility, flexibility, speed, strength and posture. I started the program with an initial assessment of my youthfulness. On a scale of 1 to 5, I scored a 2.7. My weight was 133 pounds and 28% body fat. The food plan is tailored to the person. The food plan for me is about 4 ounces of a protein and 8 ounces of vegetable for two meals and three small snacks of protein with fruit, fruit and nuts, or part of a protein bar. Towards the evening I tackled the exercises. Sequence 1 is made of six exercises. The idea is to do each of the exercises six times and repeat the entire sequence six times. Each exercise has 5 adaption levels and I was able to do all but one of the exercises at the most challenging level. I like the author’s philosophy around the exercises. If they make you sore, then you need to drop down to the next level until you are at a level that doesn’t make you sore. This matches my idea of healthy training. I once had a session with a trainer at a gym and was shocked by how hard she wanted to push me. I tend to overwork myself, yet I knew she was going far beyond the point here I needed to stop to not be sore the next day. No wonder people that start exercise programs, quit. On the other hand, it seems like some people brag about working out so hard they are sore. The body responds the best when you train at 70% of your maximum. If you train harder, progress is hampered by the body needing to repair. I also use Arnica and Access Bars to avoid the soreness that comes from lactic acid build up and the inflammation from overwork. I started the exercises and felt some frustration and dissatisfaction arise because I had to really think about how to do them. Inhale, curl toes, do movement, do more movement, exhale. I wanted to inhale and start the movement at the same time. I wanted to exhale as I did the final movement. I had to keep being aware of my resistance and affirming my choice. I COULD do the exercises any way I want, but I was choosing to see if I could do them the way the experts had designed them. I told myself that it was okay to take a month to really learn them. It was okay to be a beginner. The important part was that I was doing them. It was okay to lose count and maybe do less. Hahaha. It was okay to do them wrong and not have to redo them. I told myself to keep going. Just for today, do as many as I can. After all the resistance was in my mind not in my body. Actually, the exercises weren’t too bad, even the sixth and last sequence. 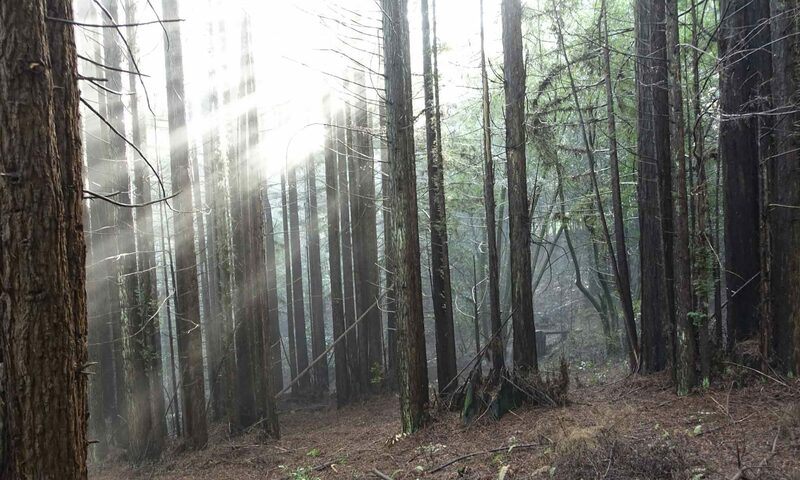 When I finished, I felt really energized. Every muscle in my body was buzzing. It really was a full body work out. I was also energized by the fact I had completed my first day successfully! On day 2, when I woke up, I could feel my body was a little tired from the work-out yesterday. I had used arnica, so it didn’t feel too sore, but there was a general sense of stiffness. This was not surprising since I had used a bunch of muscles I never use. I kept my food plan essentially the same as day 1. However, I was wondering if I should change the exercise. Different ideas came to me: Skip a day to recover, do four sets instead of six, or do each exercise at a lower level. I could also stick to the plan and just do the regular exercise sequence. I decided to plan on doing the regular sequence and see how my body feels. By the time evening came I felt the sequence would be fine. As I was finishing the first set, I was thinking I might even want to increase the weights, which I quickly disregarded. “Stick with the current weight,” I told myself, “while I was getting used to the movements.” The exercises were going fine and easy, however, by the time I got to the third set of squats, my knee was bothering me. Funny, when I started the left knee was iffy and at the midpoint of the exercises the right knee gave a brief, sharp stab of pain and then the pain with the squat persisted for the rest of the time. I am always baffled on what to do with my knees. It seems like squats are dangerous, yet the exercise given to strengthen the knees are squats. In the Happy Body program, the ultimate measure of fitness involves doing an overhead squat press with in my case 56 pounds. This is one of the reasons, I was worried about embarking on this plan. I am not sure my knees can do it. I initially injured my knees when I was 15 years old by putting strain on them when I started biking. Now, they seem susceptible to injury when I put force on them in a certain way. I am careful to line up the knees correctly and not push them too hard, but this week with all the gardening I have been doing the left one got misused. Then today, I think the right one was strained during the squat because I was favoring the left a little and carrying more weight on the right. Okay, I was overdoing it. I think I’ll do only 4 reps tomorrow instead of 6 and only if they start out okay. Perhaps I need to modified the movement as well. I can easily squat all the way down, but maybe stopping short will allow my body to adapt better. Frankly, I just don’t know. Okay, that can’t be true. What do I know that I am pretending not to know? On day 3, I woke up about an hour and a half later than I would like. 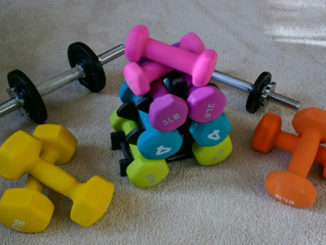 Despite being a little cranky over the late start, during my morning meditation I looked over at my dumbbells and wanted to do the exercises immediately. Perhaps a little foolish, but I talked myself out of that, since I thought I would teeter out without breakfast. My body feels good and fresh. Some muscle soreness that I would rate as a 2 on a scale of 1 to 10. Really slight. Deltoids, lumbar, gluts and my hamstrings from overstretching them. Went over the FAQs on the Happy Body site. They cover knees there. I think they would recommend I don’t squat all the way down to start. I suspect my issue is that I have greater flexibility than strength around my knees. Their whole philosophy is on allowing the body time to adapt to the changes by progressing slowly. I like the idea, but I have that tendency to push. I have to remind myself that I have chosen this and that means it is one day at a time for the rest of my life. I week or two refining the method will not matter in the big scheme of things. On day 12 I reported that “everything is going really smoothly” in my journal. It wasn’t so hard to learn the exercises and the second sequence was similar to the first so I picked them up quickly. The one thing that was a little confusing was how to deal with the fractional weights. Each sequence is based on the weight used in the first exercise of the first sequence. I started with 2 pounds, just because I had weights for 150% and 200%. However, sequence 2 required a 50% weight and I didn’t have a one pounder. I decided to pick one up at the store, but it was the weekend before Christmas and the line at the checkout was out the door. I left without the dumbbells. Instead I bumped the starting weight up to 3 pounds – which the book had recommended as a starting point for women anyway. This would make 150% 4.5 pounds and I didn’t have a weight that size. I stressed about this a little because they were so adamant to keep everything consistent, but I ended up using four pounds for a few days and when that felt light I moved up to five pounds. I relaxed some. I guess this isn’t rocket science after all. On the 12th day I started the third sequence. A couple days ahead of schedule, but I had the other two sequences down. This is easier than I thought it would be. The amazing part is that I don’t feel like I am exercising. The movements are slow, the program is designed so that you are working at 70% so the weights don’t even feel heavy. Now it has been a month. I am up to a base weight of 4 pounds. I love how easy the progression up has been. The book says that I should be able to do the 3 sequences everyday in only 30 minutes. While I can see that as a possibility, I found that when I was rushing to do that it wasn’t as much fun. I take my time, really do it as a meditation, and use slow breathing. It takes me 45 minutes to complete the set and when I am finished I feel relaxed and energized. If I am pushed for time, I’ve decided to just cut out some reps rather than try to speed up. I am still at level 2 and 3 with my squats (Level 5 being squatting all the way down so my thighs touch my calves). I am being gentle with my knees. I also noticed that when I added the last sequence of exercises that I have some tightness in my rotator cuff on the left side. My deltoid and latissimus dorsi kind of pull as well. I am happy to be gently increasing my range of motion. I have been surprised how much my flexibility has increased. Hey I thought I was weight training! In fact my youthfulness score is 3.1 now – up from the 2.7 I started at. When I started it pulled my hamstrings and left them sore the following day if I went to touch my toes. Now I can put my palms flat on the floor in front of my feet with out issue. Amazing! The program is designed to bring off about 1.25 pound of fat each week and add .25 pound of muscle. I only have my scale to track that right now. I’ll do another body composition scan in February. The scale says I started at 133 pounds and today I weighed in at 129.5 pounds. Overall, that is the looking good. However, I am a little concerned because I dropped down to 128.5 pounds at the end of the second week and then have been bouncing up and down between that and 130 for two weeks. Really wish I had the body composition scan to have more information. I have to keep reminding myself that this is a long term plan and micromanagement is a waste of energy. My ideal body weight is 125 and I don’t need to get there by February, even though I want too. I like this program because I have confidence in its ability to prevent disease and maintain my body in a happy state. I can hardly believe that I will one day have the strength to do a pull up, but this Jerzy assured me is inevitable. I checked this plan out carefully before beginning. When you are considering doing something ask the following questions. Does it make sense? Does it align with your world view and your experience? Does it contradict authority? Is it logical or systematic? Have others done it and gotten the results promised? How much effort did it take them and how long for them to realize results. Does it match your capacity? Is it something you can do? Here are my answers to those questions. It makes sense physiologically and physically. There are tons of testimonials of people getting good results. Now I’ve done a short trial and I actually am seeing positive change with myself. I also enjoy the workout and eating plan which makes it feasible long term. Whenever you embark on a program that you will invest significant time into you need to evaluate it carefully. Every day I invest about 45 minutes exercising. I have also invested time in learning the exercises and creating new recipes that match the eating plan. It seems hard to believe that this program could really keep my body happy and allow me to achieve strength I’ve only dreamed of, however it seems to check out and I am excited about the possibilities. If you have enjoyed this podcast take a moment to give it five stars and write me a review. If you are feeling stuck and would like to have a session with me, visit my website at changeanythingnow.com to find out more. Sessions for this podcast I do for free. How does it get better than that? I teach how to change the subconscious in a weekend workshop. There is one coming up soon. Visit ChangeAnythingNow.com If you mention this podcast you will get a discount. What could a weekend with me change for you? Thanks you for the feedback. Jerzy’s program is really amazing.